Big discounts for Alpana guests! Prices on inquiry. The BEST VALUE tours in the Flinders, we offer accredited station tours where the station owner is your driver, but not merely a drive with the owner; Sally has over thirty years of 4WD experience, ten years of tour guiding experience, Cert 3 in Tour Guiding (Geology), Cert 3 in Education, an extensive and ever growing knowledge of the plants, geology and history of the area and a deep love of the area, the station and the lifestyle, and it is all packed into each of the tour options below. 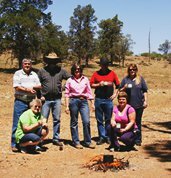 Exclusive half or full day guided tours through Alpana's private lands in the heart of the Flinders. 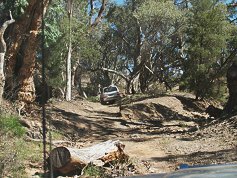 Come in our luxury 4WD vehicle and let us show you our big back yard with a true off-road driving adventure across rugged and ancient terrain into the beautiful Blinman Pools and Cascades natural springs. Enjoy the stunning and spectacular scenery and view the local flora and fauna. 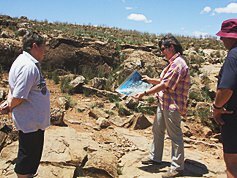 Learn about the unique and world famous geology of the Flinders Ranges as well as the pastoral and mining history of the area. Enjoy billy tea freshly brewed in the creek bed at lunchtime. Big discounts for Alpana guests. There are now two new ways to visit the Blinman Pools on Alpana Station. 10% discount for Alpana guests. Be driven* close to the Blinman Pools in an accredited luxury Toyota Landcruiser, then be guided on a hike to the Second Pool and the First Pool of the Blinman Pools Walk and back to the vehicle for the drive back. Requirements: Good fitness & mobility, hat, sturdy footwear, water, snacks, camera. Be driven close to the Blinman Pools in an accredited luxury Toyota Landcruiser, guided to the Second Pool, then hike yourself on the Blinman Pools Walk to Angorichina Village. Requirements: Very good fitness & mobility, hat, sturdy hiking footwear, water, snacks, camera. Thank you Sally for a fantastic experience — stunning panoramas, pristine waterholes and interesting facts and history. Don't change a thing! ½-day tour certainly packed a lot in. Very interesting with all the history. Scenery was spectacular, especially the waterfall. Sally has shared lots of info. Very knowledgeable and very easy to get on with. Many thanks for an excellent morning. Alpana has two scenic self drive four wheel drive tracks to choose from. Rated: Challenging. High clearance vehicles with low range capability essential. 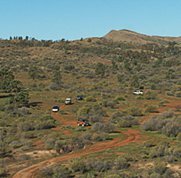 The Mount Samuel four wheel drive track takes you through the full variety of Flinders ranges scenic beauty. 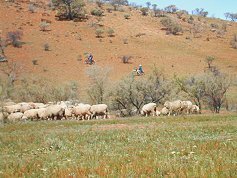 You begin by travelling through sheep grazing country before the challenge of driving along mountain ridges where you feel that you could just about touch the two magnificent Mount Samuels. The steep descent to the creek in Mount Buggery Gorge will take your breath away. 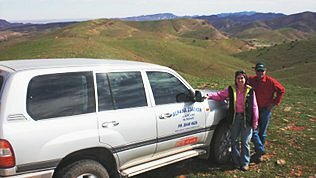 Once in the awe-inspiring valley there is a driving challenge along Mount Buggery Creek matched only by the views of the cliffs and the mountain tops of the ranges above. The scenery from the Green Well Valley as you traverse the ABC Range and the Heysen Range is absolutely breathtaking. As you leave the Alpana property after a day in this country your emotions are charged with just wanting to do it all again. This trip now also features an optional climb (on foot) to the summits of one or both of the two Mt Samuels. 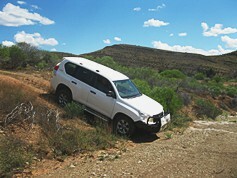 The 4WD trip around Mt Samuel was great. Fantastic tracks and scenery! Rated: Moderate. High clearance vehicles essential. 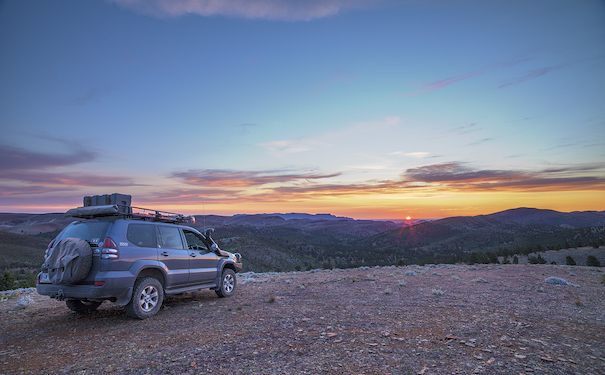 One of the most memorable experiences of a trip to the Flinders Ranges is the view of the sun setting over the ranges. 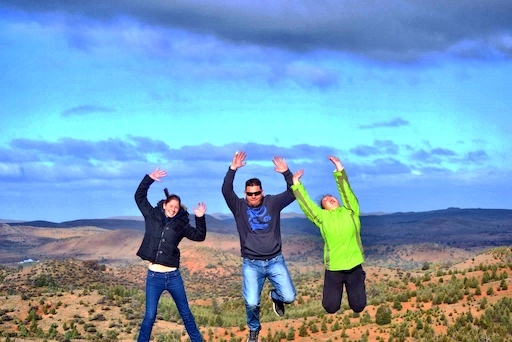 The Sunset Hill self-drive tour has 360 degree panoramic views that enable the keen visitor to view many of the major features of the Flinders Ranges from the one vantage point including the Heysen and ABC Ranges, Wilpena Pound and Patawarta Hill. Perhaps a glass of fine South Aussie wine and a nibble of cheese to top off the magnificent views before the descent ‘home’ for dinner. The view from Sunset Hill 665 is great at any time of day! An extension track to Nungawurtina Hut adds 10km to this trip, when available. We rushed from Sydney to here for our Flinders holiday and this morning we drove up to the top of Sunset Hill. What a fantastic view! We feel like we have seen enough, already seen and done the best and could turn around and drive back to Sydney quite satisfied. Thank you for sharing this amazing part of Australia! Tag-a-long tours can be arranged for the Alpana Station Experience tour or any of our other guided tours. 4 to 5 hr tour with commentary. Minimum of 4 vehicles, unless a guided tour is going anyway. $60 per vehicle ($50 per vehicle for Alpana guests). The tag-a-long tour was definitely a highlight of our holiday. You are wonderful custodians of a special and stunning area of South Australia. Our tag-a-long trip was like a box of chocolates; the variety was absolutely amazing. The smooth ones were Sally telling us so much over the two way radio. Her knowledge of everything on the station was so amazing. Also as a 60 y.o. novice 4 wheel driver Sally gave me the confidence to do all the trip myself. 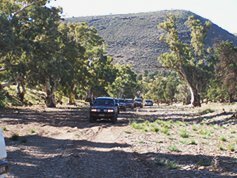 For bush walkers and cyclists wishing to be transferred to and from the Heysen Trail head in the Parachilna Gorge or other locations at the northern end of the Heysen and Mawson Trails. Fully accredited. Bookings are essential. Price varies depending on pick up and destination locations. 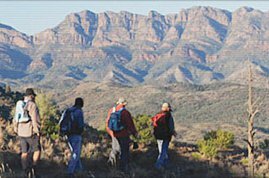 Wilpena Pound to trail head is $180 for the trip.